The LG G4 showed a strong performance in the dark, but when it comes to videos it can't lean on a hidden night mode. Videos shot at 2160p resolution look soft, with a heavy-handed noise reduction that creates smooth blotches throughout the image. The Samsung Galaxy S6 videos have a good deal of noise too, though the phone retains noticeably more detail. White balance is a bit off and colors are slightly oversaturated, while the G4 nails the white balance but colors are slight undersaturated. Moving down to 1080p helps the LG G4 deal with the noise and the image is sharper, though the Galaxy S6 still captures more detail. Winner: Samsung Galaxy S6. The videos look sharper, with more detail and the colors (while a bit off) look better. The LG G4 videos look soft, with washed out colors and the noise reduction needs work. Both phones can do slow-motion videos, by dropping to 720p resolution they achieve 120fps. Neither result is pleasing. 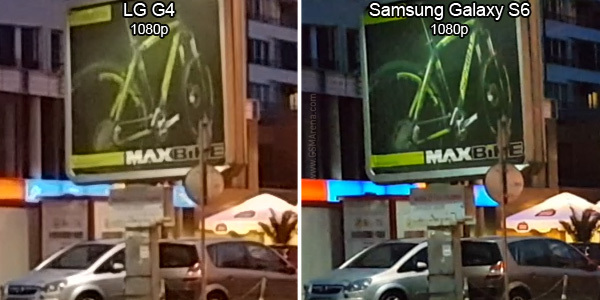 LG G4 videos appear jaggier, upscaled from much less than 720p. The Samsung Galaxy S6 preserves more detail, though nowhere near the advertised 720p either. Winner: Samsung Galaxy S6. Just barely though, both phones disappoint here. 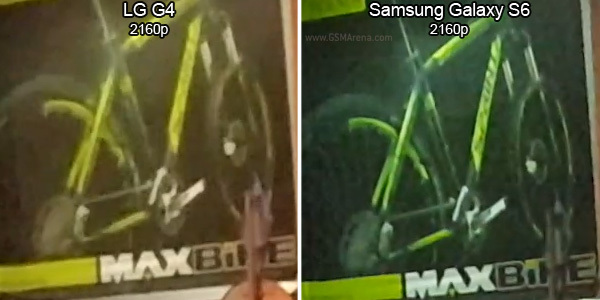 It's just that LG G4 videos are terribly jaggy. The selfie cameras produced pleasing stills, now we're turning them in video mode. 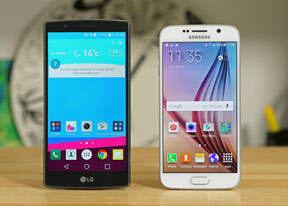 The Galaxy S6 regains lost grown with higher resolution - QHD versus the 1080p that the LG G4 records. The bitrates are 25Mbps and 16.6Mbps respectively. Another advantage the Galaxy S6 has digital image stabilization for selfie videos. Still, the numerical resolution advantage doesn't account for much since both phones capture about the same amount of detail. Winner: Samsung Galaxy S6. While it didn't make the best of the higher resolution, it has a wider field of view and optional stabilization, which will come in handy often.